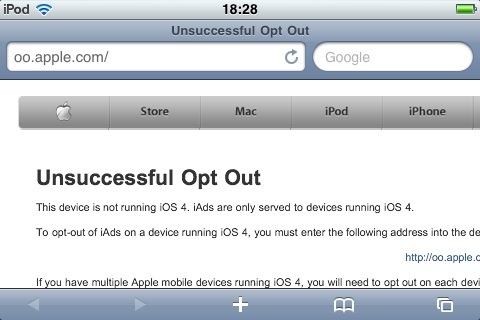 In theory you should be able to opt out from personalized iAds by pointing Safari on iOS4 to oo.apple.com. I guess it will eventually work. I still don't quite understand what it means to "opt out" of iAds. According to this technote it seems that the opt out only reduces the relevance of the ads, instead of keeping you from seeing ads at all.